We got the band warming up and some new music too!! Schoolmarm has a snack food that'll set ya's on yer collective ear!! I nominate Sue Render, Lady T, and Carolina Girl as judges for the men's portion of the dance contest!! We need two others in case of conflict of interest. I nominate the band for the women's portion, 'cause we are impartial!! Already have the dancing judges. No one will know who until time for the dancing. Don't want no bribing or anything going on! You take out the bribery and ya' spoil half the fun!! So, just cause someone said no bribery means no bribery? Remember this an Outlaw friendly match. And all along I thought it was a bunch of Friendly Outlaws! Guess I better pay attention next time! I'm sure that there will be some "behind the scenes stuff" goings on Joe. I WILL ALWAYS ACCEPT ANY KIND OF BRIBE!!! But I will always vote the OUTLAW WAY! A man of strong convictions! I have to be to keep up our High Standards. Besides, anything we get we split 3 ways and still pick the best of the bunch. Can't wait to see ya my friend. HIZZONOR has this down to a science!! I bribe 'em with the best food and drink!! I'm gonna wear my Indian Chief outfit. That should win the costume contest. Have mercy!!! PLEASE GET A TAN ON YOU ARMS AND LEGS. They were so bright last time it wrecked a satellite in space. I'll be wearing my darkest tinted shooting glasses................. ALL WEEK!! Well, mercy! Didn't expect to see this thread this early. Ya'll are gonna wear yourselves out. And.....it gives WCJ way too much time for his evil plans. HELL, Harley!! He's been cogitatin' on that since Sunday morning, July 19th, 2015!!! T-bone you better put a little bit of hillbilly in that outfit! Y'all won't believe what Whiskey's got cooked up for y'all this year! Sorry, no clues. Just talked to Widder and he is making room reservations, so I guess you all will have to put up with us. Lookin forward to seein Judge Duncan, Tombstone, Whiskey, Joe, Iron Maiden and all the other fine folks from that part of the country. See you all once it gets warm again....until then I think I'll stay here in Florida....lol. WHY WOULD YOU SAVE A PICTURE OF THAT?? Memory erasing is now required! I'm guessin' Tbone stripped off some of his accourtrements to lighten up a mite....makes him shoot a little faster. Tbone is a gamer from waaaaaaaaaaaay back!! No amount of brain bleach can erase that image!! Trust me!! I'VE TRIED!! Maiden, I gots my hillbilly costume in the works as well! Tell Whiskey it's GAME ON! KK, Fannie says she's got a year and a half's worth of hugs saved up for ya! Yes, it's been that long! After careful consideration I think Schwaby & I are gonna have to back out. 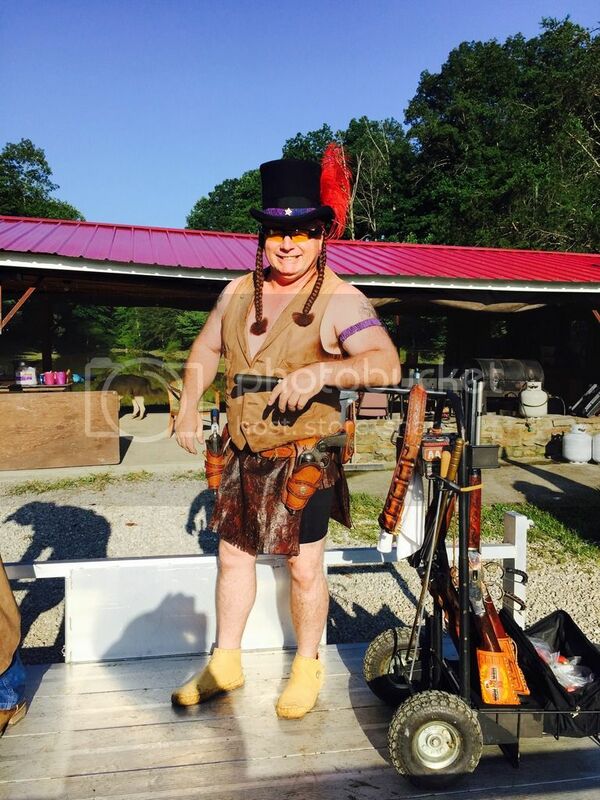 I just saw TBone's Indian costume pic and realized we had no idea just what we were up against when we decided to come to BG! This whole shindig sounds like it's just gonna be way too rowdy for us redneck yanks. There's bribery, people stealin cupcakes, unregulated liquor products, some kind of newfangled gas powered liquor makin machine, threats of payback & god only knows what nefarious games WCJ is cookin up. All of which would surely taint our wholesome beings irreversably. Just warmin up for the liars contest, heard ya gotta start early & get lotsa practice in to even make it past the warm up round. Roper, you are gonna fit right in with this bunch. Can't wait! ...... Just warmin up for the liars contest, heard ya gotta start early & get lotsa practice in to even make it past the warm up round. There was so much other shenanigans going on last year we never ever got to the Liar's contest. I don't know how Copperhead Joe does it but he can fit 30 hours of fun into one day at Black Gold. I'll be back, wouldn't want to miss the costume contest. Iron Maiden if'in you need anymore judges just let me know. Oh, come on now, have you ever seen a hillbilly wearin' chaps?